This is what happened when I felt like knitting an aran and a shawl at the same time! 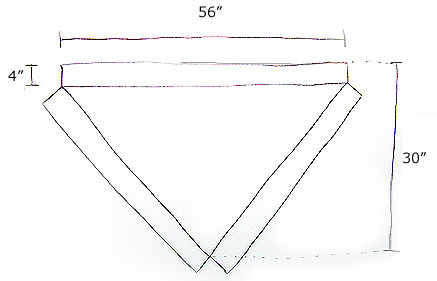 The shawl is knit from the bottom up, doing the two side borders along with the body, then the third border is sideways-knit across the top. The corners are tasselled both because I like the look and because I'm terrible at charting out mitered corners! Notes on yarn substitution: If you substitute wool or some other natural fiber for acrylic, it is important that you match the gauge with a washed and blocked swatch if you want precisely these proportions, as wool tends to grow in the washing process while acrylic does not. If you match the gauge without washing your swatch first, then your finished shawl will likely be somewhat larger than the given measurements. C2L [cross 2 left]: slip 2 sts onto cable needle [cn], hold in front of work, p1, k2 from cn. C2R [cross 2 right]: slip 1 st onto cn, hold in back of work, k2, p1 from cn. FC4 [front cross 4]: slip 2 sts onto cn, hold in front of work, k2, k2 from cn. BC4 [back cross 4]: slips 2 sts onto cn, hold in back of work, k2, k2 from cn. Row 1 [RS]: p1, k2, p4, BC4, p4, k2, p1. Row 2 and all other WS rows: k all knit sts and p all purl sts. Row 3: p1, C2L, p2, C2R, C2L, p2, C2R, p1. Row 5: p2, C2L, C2R, p2, C2L, C2R, p2. Row 7: p3, FC4, p4, BC4, p3. Row 9: p2, C2R, C2L, p2, C2R, C2L, p2. Row 11: p1, C2R, p2, C2L, C2R, p2, C2L, p1. Row 13: p1, k2, p4, FC4, p4, k2, p1. Row 15: as row 3. Row 17: as row 5. Row 19: p3, BC4, p4, FC4, p3. Row 21: as row 9. Row 23: as row 11. Row 24: k all knit sts and p all purl sts. Repeat Rows 1-24 for pattern. CO 33 sts. K 4 rows. Foundation row [RS]: k2, *p1, inc 1 by knitting into front and back of next st, p4, inc 1 twice, p4, inc 1, p1,* YO, k1, YO, rep * to *, end k2. Next row [WS]: k2, *k1, p2, k4, p4, k4, p2, k1*, k3, rep * to *, end k2. Begin cable pattern [cab patt] row [RS]: k2, work row 1 of cab patt, YO, k3, YO, work row 1 of cab patt again, end k2. Next row [WS]: k2, work row 2 of cab patt, k5, work row 2 of cab patt again, end k2. Continue working outside 2 sts for garter st selvedge on both edges. Inside that, work the 18 st cab patt rows in sequence as described above. Between the 20 stitch wide borders on either side, increase 2 sts on every RS row. [eg. k2, work 18 sts in cab patt, YO, k across to last 20 sts, YO, work 18 sts in cab patt, k2]. Work borders in cab patt on WS rows, but knit across central triangular panel without making increases. Work until you have completed rows 1-24 of the cab patt a total of 7 times, then work rows 1 and 2 once more. RS should be facing for next row [171 sts in central panel; 211 total sts]. If you're off by a few stitches, increase or decrease as necessary in next row. Next row [RS]: k2, *k1, k2tog, k4, k2tog twice, k4, k2tog, k1*, k across center section [171 stitches], rep * to *, end k2. Row 1: BO 16, k across rem sts. Row 2: BO 16, k across rem sts, DO NOT TURN. Without breaking yarn, CO 19 sts. Turn. Foundation Row 1 [RS]: k19; turn, leaving rem sts unworked. Foundation Row 2 [WS]: k19. Foundation Row 3 [RS]: k2, p1, m1, p4, m1 twice, p4, ml, p1, YO, ssk, knit rem border st tog with 1 st from the body of the shawl [k2tog]. Foundation row 4 [WS]: sl 1, p2, work row 24 of cab patt across next 18 sts, end k2. Double Dec Row[RS]: k2, work row 1 of cab patt, YO, ssk, k rem border st tog with 2 sts from shawl body [k3tog]. Border Row 1, and all other WS rows: sl 1, p2, work row 2 [or appropriate row] of cab patt, end k2. Border Row 2 [Dec Row]: k2, work row 3 [or appropriate row] of cab patt, YO, ssk, k2tog [1 border st and 1 shawl body st]. Continue working Work these 24 border rows a total of 13 times, always working Border Rows 1 & 2 across shawl. Every 24th row, Work the Double Dec Row [k3tog] instead of Border Row 2 [k2tog]. There are 25 sts remaining [2 body sts, 23 border sts]. Work Border Row 2 once more [1 body st remaining]. Next row [WS]: sl 1, k3, k2tog, k4, k2tog twice, k4, k2tog, k3. Next row [RS]: k17, k2tog [all body sts bound off by border]. K 1 row. BO all sts, leaving a 6 inch-tail. There will be a small gap where the final BO row doesn't attach to the body, because there are no sts left to work together Ü Eliminate this gap by running the tail through the top of the last bound-off st of the left cable band, then back again through the final bound-off st of the top border, before weaving the end in. Note: If substituting wool or another natural fiber for acrylic, I recommend blocking the shawl before making and attaching the tassels, as blocking the piece with the tassels in place may alter the hang of the tassels. I wound the yarn 15 times lengthwise around a videocassette, then cut it at both ends to get 30 strands, which I folded in half to make one tassel. If you prefer longer or shorter tassels, adjust the length of the strands accordingly; if you want a thinner or fatter tassel, use fewer or more strands. This is a matter of judgment and your crochet tension, so don°t be afraid to undo your work and try again if the tassel doesn°t hang well. Lower point: Join yarn to one of the outer corners of the bands, chain for 4 inches, work one sc around the yarn holding the top of the tassel together, chain for 4 inches, join with an sc to opposite outer corner. Left and right points: work the same as lower point, but for 4.5 inches instead of 4 inches. 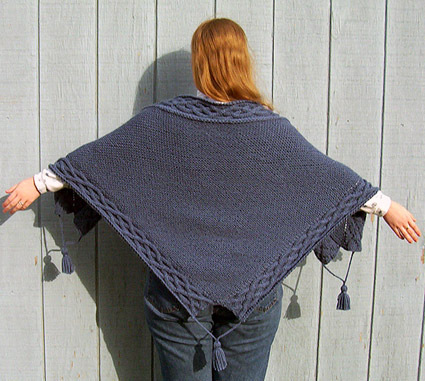 Lizzi is just beginning to dip her toes in the realm of designing, after being inspired by patterns from her fellow bloggers and knitting-forum members. She currently lives in Michigan, where the winter cold has had her knitting since the age of eight. You can visit her at her weblog, where she chronicles her addiction to knitting, her constant frustration with working in the fast-food industry - which she hopes to get out of soon! - and her love of sci-fi/fantasy books and movies. But mostly the addiction to knitting. Pattern & images © 2003 Elizabeth Jennings. Contact Lizzi.